Following on from this post, the second activity we did today from the Usborne Little Book of Easter Activities was decorating eggs. This activity was one the kids could definitely do and they loved it! To do this you start with some hard boiled eggs. Decorate the eggs by drawing patterns on the shell with wax crayons or pressing small stickers (shiny ones work best) onto it – or both!. Once you are happy with your design place three or four teaspoons of food colouring into a glass and then top it up to half full with water. Put the egg into the glass and leave for around 10 minutes. Using a spoon, turn the egg over occasionally to colour it all over. When the egg is brightly coloured, lift it out of the glass and place on a paper towel to dry. Once the egg is dry peel off any stickers. The kids have been admiring their finished eggs all day! They also want to crack them open to eat, but I think they look to nice for that! What do you think? 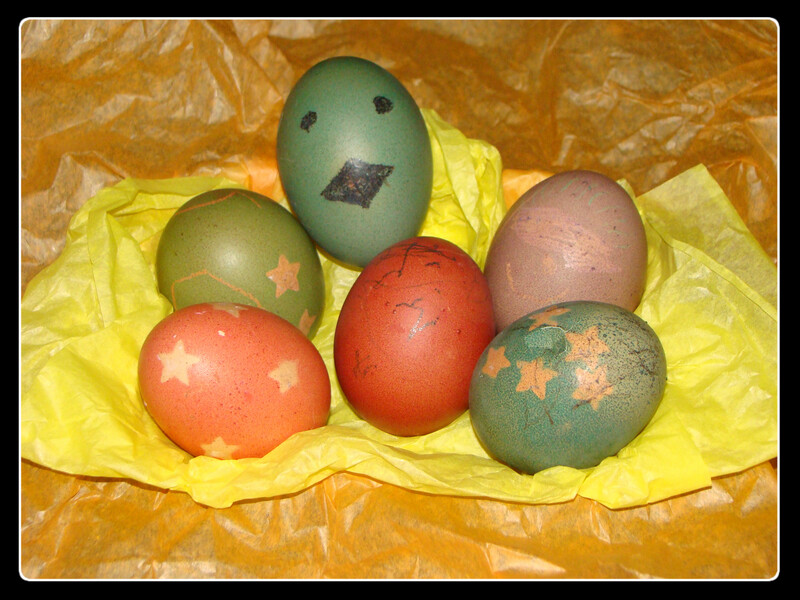 Should we have decorated eggs for breakfast tomorrow?